The process of evolution of smart technology has considerably changed the overall lighting industry in terms of energy and money saving, ensuring increased safety and convenience of the users. With the installation of the smart lighting system in a building, 50% energy costs can be reduced, enhancing the productivity and comfort of the user. The global economy is expected to exhaust more energy resources in the future owing to the rising demand for energy from the developing countries. Additionally, the risk of climate change associated with the use of fossil fuels has made the supply of energy highly difficult. Several countries, such as the U.S., India, and China, are opting for various methods in order to decrease the carbon dioxide concentration in the atmosphere. The global Lighting as a Service (LaaS) market is expected to witness tremendous growth during the forecast period 2018-2025. The market is growing due to the increasing demand for energy-efficient lighting systems. Growing implementation of Internet of Things (IoT) with lighting services is also expected to increase the adoption of this service worldwide. The report is a compilation of various segments including market dynamics, market breakdown by application, and by region. The report provides comprehensive market analysis and forecast along with the recent trends influencing the markets. While highlighting the key driving and restraining forces for this market, the report also provides a detailed study of the future trends and developments of the market. It also examines the role of the leading market players involved in the industry including their corporate overview and SWOT analysis. 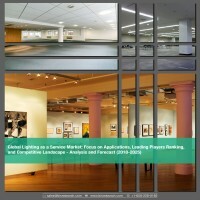 • What will be the global lighting as a service market value by 2025 along with the estimated CAGR? • What are the driving factors for the global LaaS market from 2018 to 2025? • Which factors are impending the growth of the global LaaSV market? • What are the recent trends and developments in the global LaaS industry? • Who are the leading players in the global LaaS market along with their ranking? • Which service application will lead the global LaaS market by 2025? • Which region will lead the global LaaS market by 2025? • Which application will dominate the global LaaS market across various regions by 2025? The global LaaS market is thronged with several lighting industry giants such as Acuity Brands, Eco-Engineering, Enlighted Inc, GE Lighting, LightEdison LLC, LumenServe Inc, Lumero, Metrus Energy Inc, Philips Lighting (Signify Holdings,), RCG Lighthouse, Sib Lighting, Sparkfund, UrbanVolt Ltd, Valoya Oy Ltd and Zumtobel Group AG, among others. With the increasing demand for the LaaS and its applications, companies have the opportunity to expand their services in the market through different strategic approaches. Some of the strategies followed by the contributors are product launches, joint ventures, collaborations, partnerships, acquisitions, and business expansions. The lighting sector has been undergoing significant changes since 2010. Light Emitting Diode (LED) lights are gaining traction over other types of lights because they provide high performance and are cheaper as compared to the traditional lights. Unlike other traditional lights, LEDs can be integrated into the design of a light fixture. Additionally, government organizations and commercial buildings are retrofitting the buildings with LED lights owing to its energy saving and cost-effective features. To reduce the installation and maintenance costs and facilitate the growth of the LED lights market, the manufacturers and service providers have developed a new financial structure known as “Lighting as a Service” (LaaS). This new financial structure helps public and private sector companies in capitalizing constant innovations taking place in the LED industry without any upfront costs. In this model, customers pay a monthly fee for the lighting service to upgrade the lights. The global lighting as a service market is expected to grow at a CAGR of 40.8% in the forecast period 2018-2025. In terms of application, the commercial segment is anticipated to dominate the market throughout the forecast period register the highest growth during the forecast period. This growth can be attributed to the widespread adoption of LaaS business model by various commercial organizations as it offers enhanced energy savings and cost reductions. Due to widespread adoption of the lighting as a service in various countries of Europe, such as Germany and the U.K., the Europe market for LaaS is expected to witness the fastest growth rate in the forecast period 2018-2025. The growth of LaaS model in Europe region can be attributed to the increase in the demand for energy efficient lighting system. The growth of the North America LaaS market is primarily attributed to the factors such as the presence of the market leaders in the lighting industry and government’s policy to reduce energy consumption in the region by replacing old lighting with the efficient LED lightings. The Gulf Cooperation plans to reduce carbon footprint by 2025. Reduction in carbon footprint can be achieved through a reduction in electricity usage. Currently, the adoption of lighting as a service model is minimal, however as the companies and large-scale projects start replacing the existing lightings to meet the demand of Gulf Corporation, the market is expected to witness an increased growth. The global LaaS market is witnessing a steady growth. The market is anticipated to have a beaming growth owing to collaborations between manufacturers and distributors. These partnerships will help companies to strengthen their presence in more than one region or country. Partnerships help the companies in the expansion of their business in regions apart from their manufacturing base center.